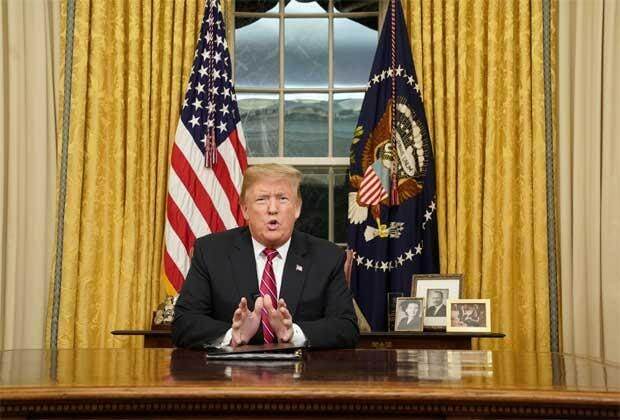 President Donald Trump said Friday he’ll declare a national emergency on the U.S. southern border in a bid to unlock money to build his proposed wall. Combined with spending legislation Trump also intends to sign Friday or Saturday, the move will free up about $8 billion for the wall, Trump’s top campaign promise, Acting Chief of Staff Mick Mulvaney told reporters in a conference call. He criticized Congress for not providing more than $1.375 billion in the spending bill passed on Thursday, enough for about 55 miles of physical barriers. “They’re simply incapable” of providing necessary funding for the wall, Mulvaney said. With Trump’s executive actions, “we should have sufficient money this year” to complete as much wall as the president proposed in a $5.7 billion budget request, about 234 miles. Trump’s gambit combines an emergency declaration with normal executive actions, and comes after he failed to convince Congress of the necessity for his proposed wall. The emergency declaration will allow Trump to redirect $3.5 billion Congress approved for the Defense Department’s military construction budget. He’ll use ordinary executive authority to reprogram $2.5 billion from the Defense Department’s drug interdiction efforts and $600 million from the Treasury Department’s drug forfeiture program, a senior administration official said on Thursday. The official asked not to be identified because the decision hadn’t been announced. A second official said Friday that the administration continues to consider additional sources of money Trump could tap to build the wall without congressional approval. Trump depicted his declaration as ordinary, noting that it’s not uncommon for presidents to declare emergencies in the event of natural disasters or other events. Two-thirds of Americans -- and more than a quarter of Republicans -- said they opposed wall construction using an emergency declaration in a January poll conducted by Quinnipiac University. One reason the president may have struggled to build political momentum behind his demand for new border wall funding is data indicating illegal crossings have declined. While it’s impossible to know precisely how many people cross into the country illegally, just 397,000 people were apprehended by the U.S. Border Patrol last year. By comparison, the federal government apprehended 1.6 million people at the border during a migration peak in 2000. And while Trump has painted many migrants entering the country as violent criminals, data indicate that an increasing number of immigrants apprehended at the border are families and unaccompanied children. In the last fiscal year, the number of family units apprehended on the border rose 42 percent from the previous year, while the number of minors traveling alone increased 21 percent. The Trump Administration also issued a report late last year conceding that there was no credible evidence international terrorists used Mexico as a base to send operatives into the U.S., and that “terrorist groups likely seek other means of trying to enter." Those data could undercut Trump’s legal arguments for an emergency. His timing also weakens his case: the declaration, coming after Congress refused to meet his funding demands, suggests to critics that his motives are political and not related to any actual change in activity at the border. The administration officials declined to discuss Trump’s legal strategy to defend the emergency declaration.